Vivid style and innovative design with a lightweight feel - the 17" Helios boot from the Hero collection has it all. The Blue-Green shaft features breathable, lightweight and flexible high-tech sport mesh that's designed for extreme durability and abrasion resistance. Crafted from an ultralight 3-D textile often found in athletic shoes, the mesh is designed to keep legs cooler than all-leather boots. It's accented with cognac leather trim that matches the foot with extended half moon toe. 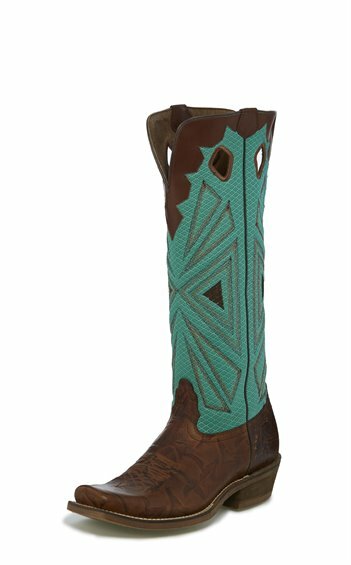 This boot is equipped with an orthotic insole for comfort and features an extended half moon toe and 1 1/8" buckaroo heel with spur ledge.